Yeah, yeah. I know you've been groaning cuz this movie franchise is getting tiresome. But who can resist watching it when it's one of the summer releases? Besides, its simple but action-packed storyline is not too difficult to consume, no? Better than movies like Priest, for instance. I went to watch with WL without much expectation in mind. I mean, you watch this kind of movie for entertainment & not taking it too seriously. There's not much of racing in this fifth instalment as the creators try to inject more rich plot, focusing on the characters' emotions. And it's pretty fun to see several main characters from the Fast & Furious series coming together as a team for a major project within the movie. 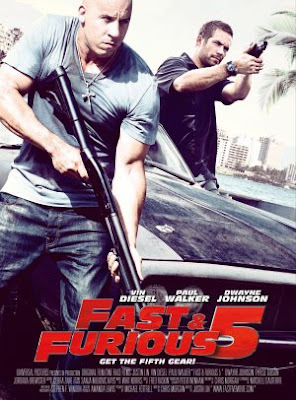 If you're unfamiliar with the series, Fast Five is loosely based on the timeline shortly after Dominic Toretto (Vin Diesel) was sent to jail by cop, Brian O'Connor (Paul Walker). The latter with the help of Dom's sister, Mia Toretto (Jordana Brewster) rescued Dom from prison. Just bear in mind that Dom's girlfriend, Letty (Michelle Rodiguez) is already dead in this movie.